What is Prolapsed Intervertebral Disc? 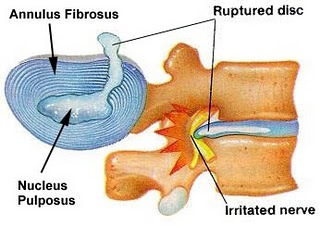 Prolapsed intervertebral disc is the sudden or slowly progressing movement of one intervertebral disc backwards into the spinal channel. Therefore the pressure on the nerve roots can cause pain, weakness of movement, numbness or heightened sensation in the nerve root area. When a prolapsed disc presses on nerve roots , it can cause pain, numbness, and weakness in the area of the body where the nerve travels. A prolapsed intervertebral disc in the lower back can cause pain and numbness in the buttock and down the leg. This is called sciatica. Sciatica is the most common symptom of a prolapsed intervertebral disc in the low back. How is Prolapsed Intervertebral Disc Diagnosed? In order to diagnose a prolapsed intervertebral disc, a thorough physical examination is conducted. It can help to exclude a disturbance of the blood supply or circulation of the legs and enables the doctor to draw conclusions as to the location, grade of the prolapse and the extent of the neurological involvement. An x-ray helps in diagnose as it enables the doctor to look at the bone structure of the vertebral column. An MRI is the most definitive scan as it can show how many levels are involved, the size of each prolapsed disc, and the extent of the nerve root impingement. What are the causes of Prolapsed Intervertebral Disc? One of the causes is the weakening or a tearing of a tissue ring due to over straining of the vertebral column. This usually is caused by wear and tear. What are the treatments for Prolapsed Intervertebral Disc? Conservative treatments include bed-rest, medication, injections and physiotherapy to strengthen the back muscles. Sometimes surgery is required when the disc prolapse causes significant neurological impairment such as signs of paralysis.